It’s not very difficult to make this world a better place: it just requires everyone to put life into their work and follow their heart. Let’s start doing it today! To inspire you, Bright Side has found several photos of great people doing their work marvelously and even saving lives. An elderly man in Florida was mowing the lawn when he suddenly had a heart attack. These firefighters not only helped him with his condition but also stayed behind to finish the job. This policeman worked hard without rest for many hours helping victims of Hurricane Harvey. As a result, he simply passed out from exhaustion. Parking attendants in a city in South Africa got tired of drivers illegally occupying handicapped parking spaces. They installed this sign, and the problem was solved. 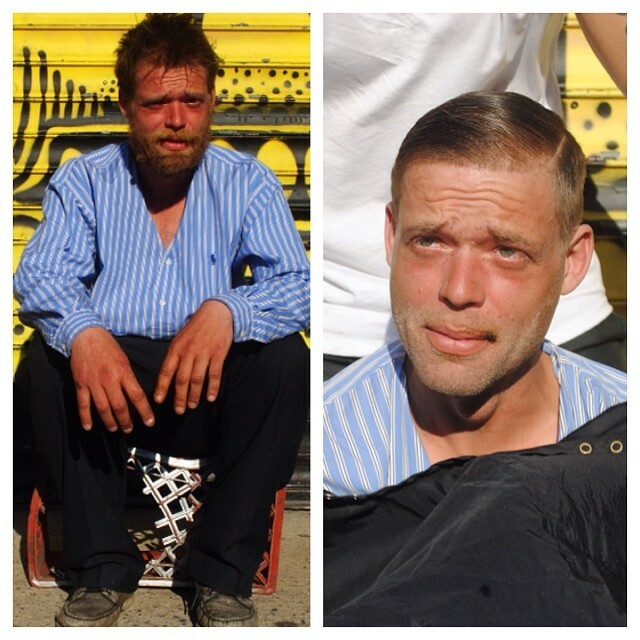 Hairstylist Mark Bustos spends his days off providing free haircuts to the homeless. This employee seems to take their job very seriously. As the Christmas season began, this person built a huge snowman with drinks boxes to please customers. This girl spent 3 years working at a dog boarding facility, and then she got another job. She had taken care of this dog for 6 months. Apparently, the girl did her job very well because, after 3 weeks of not seeing her, the dog was very happy to meet her again. This teacher comes to the hospital every day to visit his seriously ill student and tell him about everything that happened at school that day. Christmas is the busiest time for postal workers. Everybody is in a rush to send greetings to each other and often can’t manage to do it on time. This postal worker decided to break the usual routine so that each card and gift would get to the addressee on time. This waiter patiently helped a disabled lady to eat so that her tired husband could also relax and finish his meal. Mike works at a gas convenience store. His unusual look is meant to make every visitor smile at least once. A pregnant woman was walking her dog when it suddenly ran away, and she couldn’t run after her pet. But this policeman, who was nearby, went to catch the dog and brought it back. This hairdresser knows how to work with children so that they don’t cry. The main thing is to do this work imperceptibly but still perfectly. This Uber driver is thoroughly prepared to meet his customers: he keeps everything a passenger might need in his car. This restaurant employee took an umbrella from a table outside to follow an elderly man to his car in the pouring rain. A pizza restaurant cordially invited those who couldn’t afford a meal to share a festive dinner with them. When an elderly lady was getting off the bus, she almost tripped. The driver noticed that her laces were undone, and he left the bus to tell her. The lady replied that she was aware of that, and he realized that she just wasn’t able to bend down. So the driver tied her laces for her. The lady was so moved that she blew a kiss toward the bus. After this shot went viral around the world, Shawn Wiebe was called the Ridiculously Photogenic Firefighter. In this photo, Shawn is saving an elderly lady during a flood. Why is he smiling like this? In fact, the woman coquettishly told him, "Oh, I haven’t been carried like this since my wedding day." Several passers-by formed a human chain to save a dog that fell into a lake in Almaty, Kazakhstan. This boy put himself in danger to save his puppy during a flood in Vietnam. An 11-year-old boy runs into traffic to rescue a dog that was hit by a car.